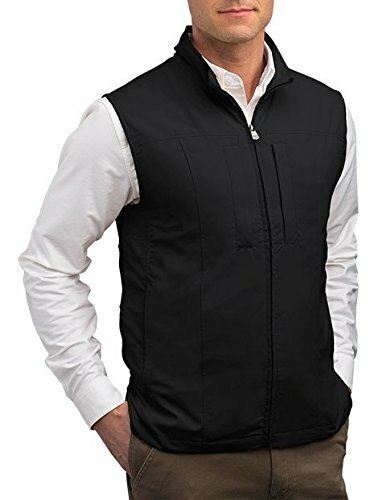 #1 selling travel vest just got personal with the added feature of an RFID-blocking pocket to protect your valuables from high-tech skimmers that can steal your identity. Our advanced two-way zipper allows you access to all 26 pockets with ease. We've also updated the CollarConnect for quicker install and more comfort. There's more than meets the eye and even more that doesn't. PATENTED PERSONAL AREA NETWORK (PAN) - a network of hidden conduits to connect wires to devices while they are in your pockets, including power banks, charging cables or headphones. Keep gadgets and electronics at full charge wherever you go, and never deal with tangled headphones again! WEIGHT MANAGEMENT SYSTEM - specially engineered to balance the weight load across the entire garment so your neck and upper back won't get tired or sore. Gadget friendly and tech savvy, stay fully loaded with gadgets, electronics, everyday carry items and more. RFID BLOCKING POCKET - specially engineered pocket that blocks 13.56 MHz frequencies to keep your credit card and passport information secure from high-tech skimmers and thieves. TRAVEL CLOTHING - with so many pockets, you can use this garment to avoid baggage fees while by carrying all your gear close-at-hand.